Really, what's more fun than planning a fun party for a good friend? Nothin', I tell ya. 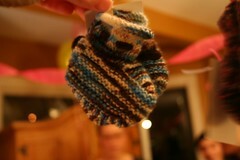 I was in Boston last weekend for Alison's baby shower, which was an utterly knit-astic event (she wrote about it here). Everybody who could do so knit booties; my contribution to the booty (ha!) were these little numbers, knit up in Dani's sock yarn in the Taos coloway. 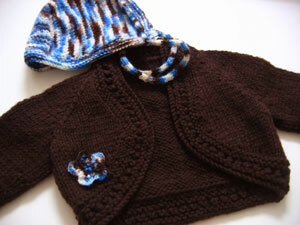 I also used the Taos to make a matching baby bonnet and a flower for baby's bolero. A little side story: I bought the pattern for the bolero (which I can't find online) and the yarn in Edinburgh in January at a terribly British department store called Jenner's. Both are from Sirdar, and I was super excited because -- despite my current inability to find it again (ETA: Found it!) -- I'd seen the pattern online and loved it, but couldn't find it anywhere in the US. Well, apparently I was so excited to find the pattern that I got the yarn in the wrong weight. By the time I realized my error, I was Stateside again and couldn't find a single place that would sell me the color in the correct weight. Good thing I'm pretty good at math! I was so happy that we were able to surprise Alison, and celebrate her and the new baby as they so richly deserve. It was even worth going to Boston in January! Thank you so much for the wonderful shower! All the booties were amazing and it was a total surprise. Love the baby shrug (I couldn't find it online either - hrmpf). Baby's going to be so cute in it. And the beautiful Taos bonnet and booties will help her look pretty and girly even when she's wearing some blue hand-me-downs from the boys! Aww, that bolero is super cute! Looks like it was worth the extra effort. The bolero is very beautiful, you did a great job. I love those booties! They're so cute they make me want to have a baby. Well, not really. But they do make me wish one of my friends was having a baby!